Housing Round-up: Rally for Stronger Rent Regs. A Segregation Scorecard. More Development for NYCHA? Edenwald Houses in the Bronx. 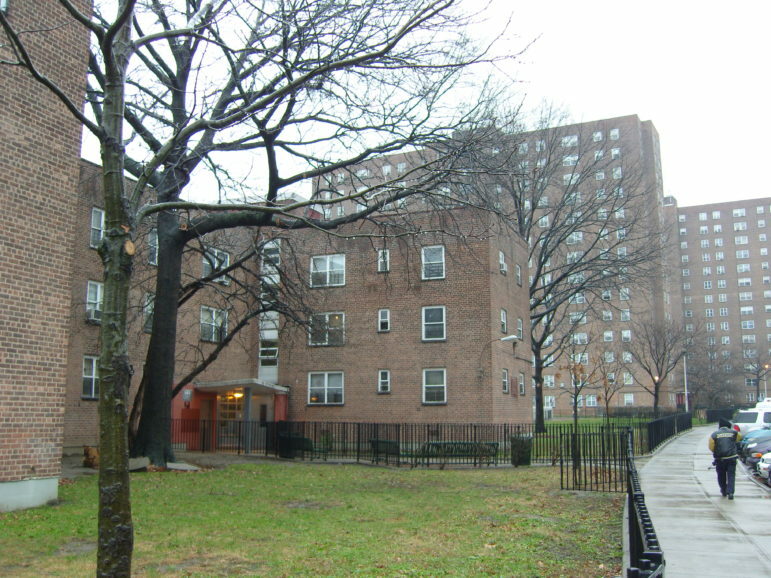 A report says that NYCHA's 'underused' land is an asset that must be employed to save public housing in New York City. • The de Blasio administration is currently pursuing neighborhood rezonings for Gowanus, Brooklyn and Bay Street, Staten Island. Another one along Southern Boulevard in the Bronx could come next. The Department of City Planning on Thursday night begins a series of topic-specific community meetings, this one focused on housing that, according to the DCP website, will address questions like, “How should we ensure the community remains affordable for those living there today? What resources are available to tenants, homeowners, and landlords to keep housing affordable? How should we ensure healthy, quality housing?” That event runs from 6:00 p.m. to 8:30 p.m. at East Bronx Academy at 1716 Southern Blvd. (off the 174th Street stop of the 2/5 train). Take Back the Bronx, an organization that says it “opposes the De Blasio administration’s rezoning plans, imposed on communities across the city, as a false solution to the city’s housing crisis” will rally at the site against the meeting. • The crucial balance between community deposits and bank investments is tilting the wrong way, according to a report by the Association for Neighborhood and Housing Development. It found that from 2016 to 2017, reinvestment in New York City declined by 30 percent. “Deposits increased 4.6% among retail banks and 5.9% outside of Manhattan. Half of all banks increased deposits but decreased reinvestment in New York City. And only five banks reinvested over 5% of their local deposits, down from 11 in 2016,” the study reads. • Any landlord who charges a prospective tenant for doing a credit check would have to share that report with the tenant, under a proposed new city law. The measure authored by Councilmembers Andrew Cohen and Carlina Rivera and backed by Comptroller Scott Stringer would also require that applicants only be charged for credit reports if the apartment in question is actually available. • NYCHA should develop its “underused” land much more aggressively, recommends the New York Building Congress, which on Thursday laid out a five-part, 30-year plan for putting the authority back on track. First, NYBC says, federal officials should declare a state of emergency at NYCHA developments and “remove regulatory roadblocks to move along repairs and renovations for which funding is already allocated.” Then NYCHA should shed its management portfolio down to 100,000 units by converting more and more conversions to Section 8. Next, the city should allow NYCHA to transfer its air rights “beyond adjacent properties,” raising a potential $2 billion in money for the authority. And NYCHA should aim to build 20,000 units through infill development, the Congress recommends. It is interesting that Councilmember Lander is concern about ending what he perceives as segregation in the public schools only after his children benefited from attending mostly white schools in Park Slope. A hypocrite like Ocasio-Cortes. But this is the same Lander who unethically pushed through a 32% salary hike for him and other council members and is out to nickel the poor and middle class in instituting a nickel tax on paper bags as he dictates that shoppers must get use to losing their free plastic bags, which are provided as both a courtesy and free advertising from the store owners and go through the daily stress of counting out how many of our own bags we need to bring to the store before leaving home. But, Lander, who usually doesn’t think before talking, didn’t take into account that consumers don’t know how much they will be buying so they will end up paying for more environmentally damaging paper bags (which come from trees and uses up more energy-fossil fuel than plastic) which are useless on a rainy day. What does Lander care about the average man or woman who shops as he grew up in a rich mid-western home in the suburbs and went to the best schools. Regardless of the plastic bashing from Cuomo and others, the majority of voters still want stores to continue providing free plastic shopping bags. It is false that these bags area used only once as we all find other uses for these plastic bags whether it is our kids protecting their school and library books from the rain, storing food and clothing, carrying items daily – just look at subway riders – and to hold our garbage until we throw it down the shoot door in our apartment buildings. If Cu0mo and Lander walked around Brooklyn or Queens, they will understand that the plastic bags which fly around all come from take-out restaurants, which are not affected by the Cuomo plastic bag ban. We ALL find uses for ALL our plastic bags? I suppose that could be true, if one of those uses is throwing it on the sidewalk. I disagree. Most New Yorkers save the bags and re-use them to line small garbage pails or for storage. As Michael said, what good are paper bags in the rain and what about shoppers who commit the terrible ‘crime’ of not bringing enough of their own bags with them. I can put my groceries in the truck of my car, but most New Yorkers aren’t in that situation and will have to lug home their groceries. I live near a the large stop-n-shop on Hylan Blvd. I never see loose bags blowing around the parking lot or stuck in the trees. The plastic bag ban is just another way to aggravate middle-class New Yorkers. I don’t know about you, but even a modest weekly trip to the supermarket for my family generates at least five bags — 10 if they double bag. That could mean 40 bags a month. And that’s not even counting other shopping that might generate bags (liquor store, pharmacy, etc). We save each bag and while we, like you, re-use them, we end up with a massive surplus of plastic bags. You’re right that paper bags are not ideal. Reusable bags are the way to go. It takes a little practice but you just get used to grabbing them before you go to shop. People eventually learned to recycle. We can pick this up, too. Several trees outside my living room and bedroom windows have plastic bags hanging from them. It took about 3 years for one of them to be blown off. It has recently been replaced by another in the latest wind storm and it will also likely be there for years with the others. And then there is the ocean to think about…. Reusable bags ARE the way to go. I carry two with me most of the time. They roll up, are very strong and weigh next to nothing. I hope the City distributes them for free.